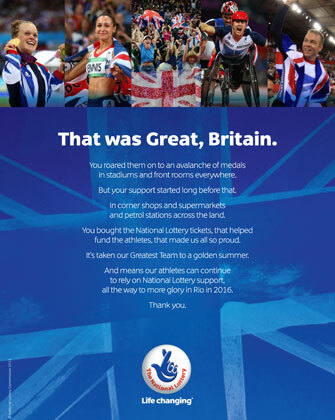 Camelot has released a press ad showcasing winning British Olympic and Paralympic athletes, and explaining how the nation has supported them by playing the National Lottery. The ad, created in-house by Camelot, was placed in yesterday's London Evening Standard and today’s (11 September) newspapers by Camelot's media agency OMD. It will also run on Friday (14 September) in the Glasgow Herald and The Record, to tie in with the Scottish athletes' parade on Friday. 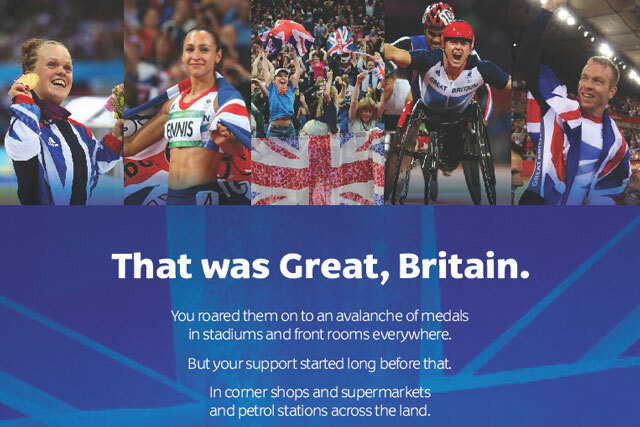 The ad reads, "You roared them on to an avalanche of medals in stadiums and front rooms everywhere. But your support started long before that. In cornershops and supermarkets and petrol stations across the land. "You bought the National Lottery tickets that helped fund the athletes that made us all so proud. It's taken our Greatest Team to a golden summer. And means our athletes can continue to rely on National Lottery support, all the way to more glory in Rio in 2016. Thank you."